The School District of Philadelphia has released School Budget information for the 2019 Fiscal Year as a collection of PDFs, one for each school. This Python download script (in the form of a Jupyter Notebook) aggregates these budgets and outputs them in a few CSVs. An online challenge to identify those with a criminal history from those without, with the expectation that one cannot tell the difference from another. A portrait series of all participants involved. A video series that will provide all participants an opportunity to explain their experiences. Right now, there is a great need for court interpreter in Philadelphia for languages like Vietnamese and Korean. I want to build an website to help people study for these test. I have the content to study for the English court interpreter test. I would love to chat with someone in education or a designer or UX to figure out how to build this. Feel free to email me at nhu313@gmail.com to chat about this. The website I have built with my teammate is usable, but I think it could be better. Basically, something like Donorschoose, but 1) specific to Philly and 2) no money involved - Philly schools aren't allowed to ask for money, so Donorschoose isn't an option. Give folks in Philly a easy way to navigate around using public transit, and use landmarks as a point of reference to help them navigate. What will this application do? What else might be useful for this application? I'm going to write a C#/.NET program to clean the data, create common formats and master files, and interactive visualizations of the data. Ultimately I'm hoping to deploy it to a web framework. At the Code for Philly 2015 #AppsForPhilly Health hackathon, a homeless person wrote, on a board, "It feels like the doctors don't care how expensive the drugs they are prescribing are." They didn't stay, but that expression of frustration inspired a team of doctors &amp; developers to attack that problem. The goal is to translate real time solar radiation and wind data into a graphic descriptor of the availability of energy from renewable sources. Users could use the simple interface to decide whether or not to plug in. Need immediate help with data discovery of real-time wind data and historical time series data sets for electricity production from renewables. Private weather stations and solar panels could be a high value data set, but their availability is unknown. The purpose of the Hacker Resource Management project is to come up with a solution to a problem faced by Code for Philly and many other Code for America groups — the difficulty faced by many potential hackers (especially newcomers) in connecting with a project who's need matches their skills. Currently, the goals are two-fold (1) come up with a method of organizing a committee to address such a need and (2) if necessary, develop any tools that such a committee would need to use. More about this project will be stated as it becomes determined. But not everyone does! How do we keep track of how many people attended? How do we monitor how many new people show up a second time? To continue to build a great community, we need to be able to measure our progress. It's not that people don't want to check-in; they forget to do it, or they can't remember their password, or they get busy. Let's make it easy and automatic! Will work on any US based first line address but standardizations are tweaked specifically for Philadelphia addresses. This project will customize the shareabouts crowd source map architecture created by OpenPlans to become a web tool citizens can use to report instances of illegal household short dumping. So far three people have contributed - David Siah, Patrick Hammons, and Jon Tehrani. Next steps include loading a geojson data layer of big belly points into leaflet, and creating a buffer to make it easier for users to drop pins on the map. A civic project to assist tourists and locals to quickly navigate to quality food experiences. A meta-project for organizing events and matchmaking to help Philly high-school and college students explore technology through civic projects. Philly Police Droid (PPD) is a Android mobile app that updates users on local crime activity in the city of Philadelphia. PPD displays data of the city's crime activity, traffic advisories and unsolved crime video by police district. Also, users are able to set news alerts based on districts in which they're concerned about. Objective: Design a Web based application, oriented for children, teachers and parents to track the books the kids read, and assess the learning of content and children progress. Provide teachers and parents tools to assess children reading progress. Provide class reading groups, where teachers can scope the discussion of books. Share teacher-created resources for specific books to use in the classroom, to enhance literacy skills, aligned with the curriculum and standards. uForage Philly is an app for finding street vendors and food trucks in Philadelphia. Building an app & site for the N3rd Street community. To include, but not limited to: news feed, forum, events list, map of companies, jobs, and available real estate. I'm working on an app for the Pebble smartwatch to help people find their next bus. Collaborate data on brown outs and fire incidents in Philadelphia. In the future the trip of the browned out station will be calculated and compared to the responding station in order to find out if the response time was affected by the station brown out. Note: this project is heavy on data manipulation and coding. and trashed by philebrity for having no context what so ever…. The Problem: In many cities, there is no centralized information repository to serve the immediate needs of the homeless and hungry. In Philadelphia, for example, there are 40 shelters and 4 intake centers, and an unknown number of organizations that provide food – real-time communication between them is minimal to non-existent. As a consequence, there is no easy and accurate way to guide people in need to available shelters and meals. The Goal: To quickly and accurately guide persons in need to closest available and open food and shelter resources. We are building a network of community advocates in neighborhoods, community centers and churches. This process will provide personal, one-on-one "real needs" counseling and "match making" of needs to resources to help people find the social supports and material connections needed to make everyday living more productive and less difficult. This project will encourage key people in every community to LISTEN to their neighbors, use and teach data tools and web sites to RECORD useful information, and help people CONNECT with each other when appropriate. The entire city is our free botanic garden! Use PlantSwapr to offer and find plants to swap with others near you. Post a photo, write a blurb, make a wishlist, check the map, and get swapping! 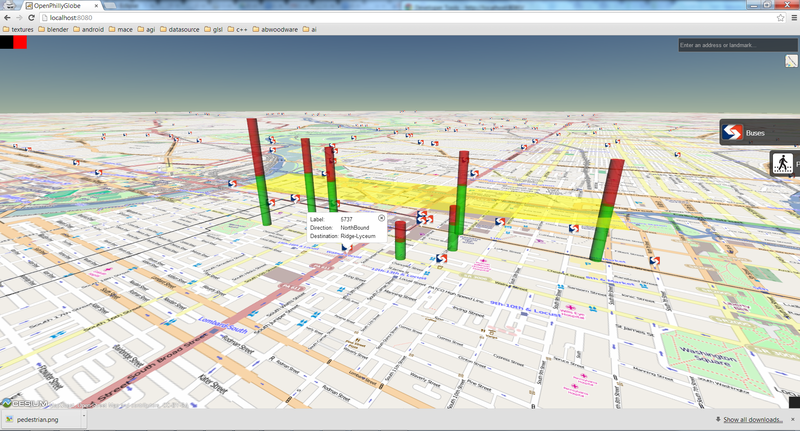 "Google Earth for Philadelphia" with open source and open transit data. Interactively visualize SEPTA routes and pedestrian counts. Middle-mouse button drag to tilt the view. More transit layers to come in the future. Real-Time SEPTA locations and average weekday pedestrian activity at Philadelphia street corners in August 2013. To see the underlying resource data, look at the networkofcare_lat_lng.csv within the /data folder. Apps for Philly Transit Hackathon! We want to use Census LED data to analyze where people in Philadelphia live and commute to work. How long does it take to walk or take public transit to the nearest public school throughout the city? How has that changed, city-wide, after the recent public school closings? Let's build an interactive map that visualizes travel time to the closest public school — with options to show the map with the data from before the closing, after the closing, or allow the user to build their own map by interactively closing or opening existing schools. We are working to see how innovations are created and spread through hackathon competitions. We're curious to know how designers and developers can produce software/websites given the time restriction, with the focus on technological enablers such as gits and APIs. We're looking for some hackers to help us understand these innovation dynamics. Here's the link to the website for potential interview subjects & a mini-survey. We're creating a new social media app (native and web) to make it easier for anyone to show off their talent and succeed in life. If you're interested hit me up @ kevin@vuid.co (don't judge our website, it's slow and intentionally stealthy right now - but we think you'll like the app - or maybe not). The Philly Public Cloud will utilize OpenStack together with community-contributed hardware, rackspace, and management to provide free hosting for public-service apps and sites. We're currently working on a public health repository over at http://codeforphilly.org/projects/Public_Health_Data_Repository - visit THERE for updates, not here. Note: May 28th, 2013 - Deleted Developer URL since it gave Error404 message. Goal: Make it the Yelp.com for Parties and Events within Philadelphia, PA.
Google Maps: Google Maps can be used to pin point the parties by the day that they occur. There should be a filter on the map that allows you to show only the day, the week, or the whole month, and filter via neighborhood. Nightlife is a mobile app and web app for partying in Philadelphia, PA.
A way for Philadelphians to discover stops/stop times close to their location, and to keep tabs on their favorite routes/stops. First on iOS, then perhaps on Droid. Then.. Windows Phone. A collection of documents, tools and articles on how to create and manage single purpose servers. Cite Club is an attempt to incentivize and streamline the process of fixing  tags on Wikipedia entries. It works by streamlining the process of finding facts that require citations and generating the proper code/markup to cite those facts.